Ugh, the dentist. Now wait, maybe I shouldn’t say it like that. I guess there are some people out there who don’t mind their visits to the dentist. (I dunno…are there?!?) Confession: I haven’t been in 15 years. It’s not something I’m proud of, and it’s probably a dry spell that’s coming to an end. You see, now that I have children, I have to do this thing called Setting A Good Example. My husband took the initiative and scheduled my 5-year-old and 3-year-old for their first dentist visits. 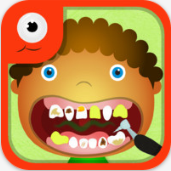 The last thing I want is for my dental anxiety to rub off on them; therefore, I decided to look into what kind of dentist/teeth-related apps are out there. 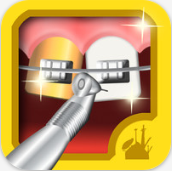 My thinking is this: If going to the dentist on the iPad is fun, then surely going for real will be a blast, too. Us adults are too smart for that kind of logic, but my kids are young enough that it just might work…. 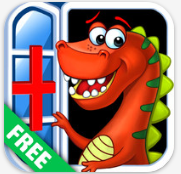 Dr. Dino – Doctor Game For Kids FREE by Avocado Mobile Inc.
Now that your child has practiced their dentistry skills on little critters and dinosaurs, he’s sure to be ready for monsters. 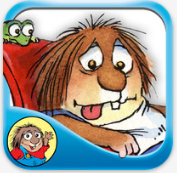 As a dentist for monsters, your little one will be able to provide an array of services for his wacky monster patients, such as cleaning, x-rays, and extraction. 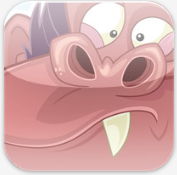 FREE, 9+ rating for infrequent/mild cartoon or fantasy violence.